When I was a kid, one of my favorite winter activities was sledding. Yes, I had a classic Flexible Flyer. But today it’s getting harder and harder for kids to find good places to sleigh ride in the suburbs, due to overly-protective “nanny state” liberalism and overly aggressive tort lawyers and casualty insurance companies (which force municipalities to crack down on any activity that might remotely trigger a lawsuit). Perhaps somewhere in northern New Hampshire . . . Still, it’s nice to see that suburban parents and kids can still find small bumps in the landscape where a piece of slippery plastic might still give a kid a quick thrill after a snowfall. 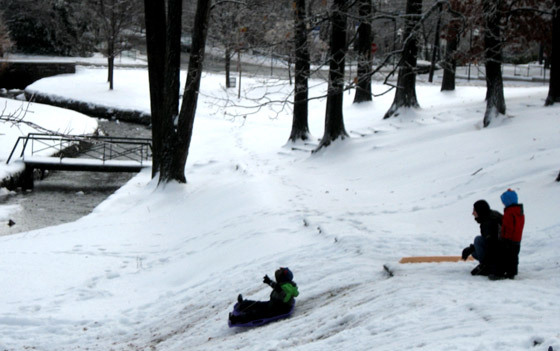 So, here’s a modern suburban wintertime scene with a little boy enjoying his 5 or 6 second run down a micro-slope. (Even though it’s still late autumn, actually!). Jim, Yes, you ae right. Things were so different years ago when it came to kids; parents could simply let their children play and have fun without worrying. Yet, today things are so different with all the shootings, attempted kidnappings, etc., that happen. Then there are the actual shootings in schools that make going to school a life-threatening activity. In so many ways in our own lifetimes things have changed radically. It’s hard to say if they have changed for the better or for the worse. I guess time will tell about that.